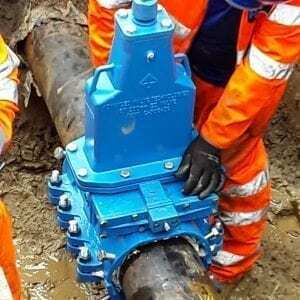 Yorkshire Water has tested “innovative valve technology” designed to reduce supply interruptions when water pipe repair work is carried out. The company is looking at new technology to help it work towards its ambitious target to reduce leakage rates by 40 per cent by 2025. It said the “EZ Valve” technology means water does not have to be re-zoned when carrying out repairs, which will result in less supply interruptions and discolouration issues. Typically, water main repair involves re-zoning several kilometres of water pipes or temporarily shutting off supply before damaged pipework can be isolated, clamped and fixed. The new rubber valve means that small sections of pipework can now be controlled to close off water flow, which will allow for “pinpoint repairs” of leaks and bursts without having to interfere with customers’ water supply or disrupt the network. Adrian Roberts, field technician at Yorkshire Water, said: “Through speaking to customers we recognise the impact interrupting water supplies can cause and so we aim to reduce average supply interruptions customers experience each year to just two minutes by 2025. Yorkshire Water aims to reduce its leakage rates by 40 per cent by 2025 to make it an “industry leader”. To help achieve this, more than 30,000 acoustic loggers are currently being fitted by the firm into its pipe network that will enable data scientists to listen to the flow of water and detect audio signals that highlight discrepancies which indicate a leak or a burst. “This new approach by the firm is part of improving visibility and creating a “calm network” to combat the issue of pressure surges, it said. A report on resilience published by the Consumer Council for Water (CCWater) on 30 August highlighted overall leakage levels rose by 1.5 per cent in 2017/18 to 3,170 million litres per day. It also showed that in 2017/18 the average amount of time that consumers were without a supply of water increased from 10 minutes and 45 seconds to 22 minutes – a rise of 105 per cent. This increase was largely attributable to the severe cold weather and rapid thaw experienced by many regions in March 2018 which caused pipes to burst. CCWater has called for all water companies to learn lessons from this incident to meet the growing challenge of climate change and ensure that they are better prepared to minimise supply interruptions in the future.